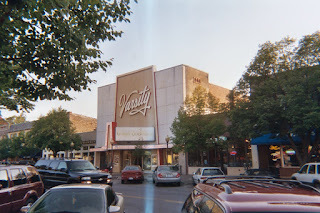 I didn’t go to movies much during my undergraduate or graduate school days, but my last night in Lawrence KS at KU my first graduate school semester there in 1966, I walked from McCollum Hall (now torn down) on top of Mt. Oread to downtown Lawrence KS (the Varsity Theater) to see “The Chase”, directed by Arthur Penn, produced by Sam Speigel for Columbia Pictures. A small town in Texas has the creeps when it learns Bubber Reeves (Robert Redford) has escaped from prison up north and is heading down. The sheriff (Marlon Brando), the cheating son (Robert Duvall), and oil man Rogers (E.G. Marshall) fight it out. What impressed me (but not my roommate) was how people in a small town spread rumors and get so focused on the damage that can be done by one person, and it seems like it takes a battle of the titans to do anything about it.